 FM Approvals has been notified by Graco Inc. of a potential safety concern involving FM Approved Graco PRO Auto Xs Guns: 24A206, 244589, 244590, 244591, 244592 and Graco PRO Auto Xs Shroud Cover Kits: 24B531, 245312 manufactured between June 2010 and June 2012. Product and Customer Service information is available on the internet at http://www.graco.com/us/en/products.html. Graco PRO Auto Xs Guns: 24A206, 244589, 244590, 244591, 244592 and Graco PRO Auto Xs Shroud Cover Kits: 24B531, 245312. 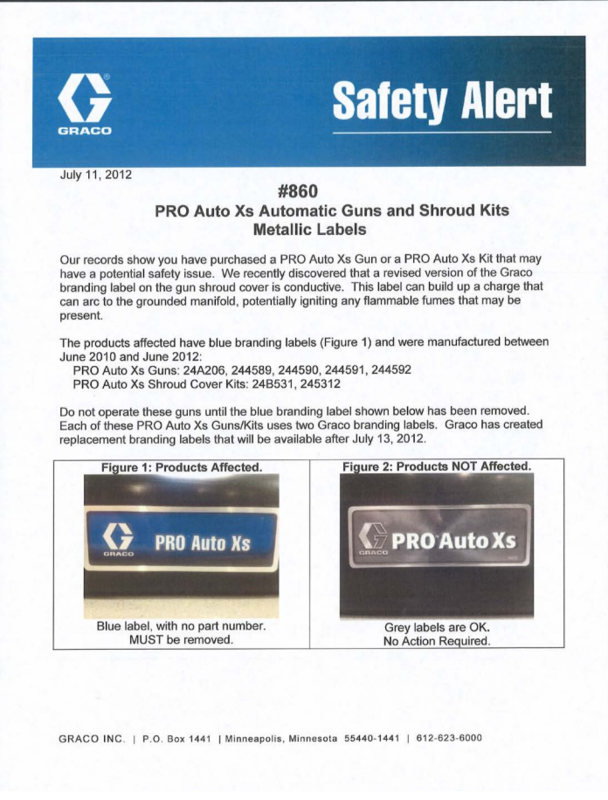 Graco Inc. has identified a potential safety concern affecting Graco PRO Auto Xs Guns: 24A206, 244589, 244590, 244591, 244592 and Graco PRO Auto Xs Shroud Cover Kits: 24B531, 245312. Graco has discovered that a revised version of the Graco branding label on the gun shroud cover is conductive. This label can build up a charge that can arc to the grounded manifold, potentially igniting any flammable fumes that may be present. These guns should not be operated until the blue branding label shown below is removed. Each of these PRO Auto Xs Guns/Kits uses two Graco branding labels. 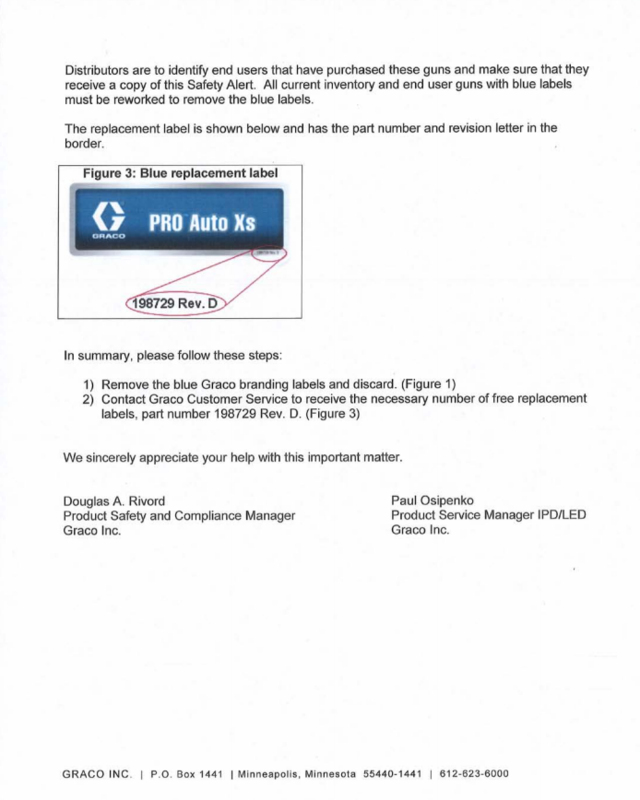 Graco has created replacement branding labels that will be available after July 13, 2012. Graco Inc has issued a product safety notification regarding FM Approved Graco PRO Auto Xs Guns: 24A206, 244589, 244590, 244591, 244592 and Graco PRO Auto Xs Shroud Cover Kits: 24B531, 245312 manufactured between June 2010 and June 2012.